Bill Printy only finished eighth grade. Then he was needed on the farm. In 1941 he enlisted in the Army. Later that year, Pearl Harbor was bombed. Bill fought in the Philippines and then New Guinea. He earned the expert infantry badge and the combat infantry badge. I suspect his boyhood of hunting squirrels and rabbits for food was helpful in this regard. 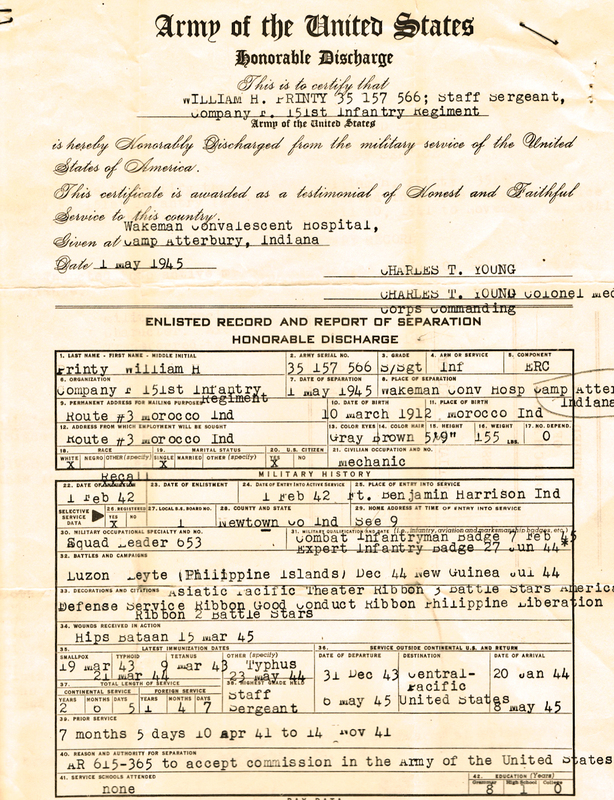 He earned the Asiatic Pacific Theater Ribbon, three battle stars; the America Defense Service Ribbon, the Philippine Liberation Ribbon, and two more battle stars. Bill talked little about the Island of Corregidor or Manila Bay. He rarely spoke of Bataan, where he was wounded. Bill would, however, talk about the New Guinea natives. Their bellies distended over grass skirts. Their little huts. Babies sleeping in slings hung on low limbs as their mothers worked their gardens nearby. The special grass hut for religious ceremonies or worship. The enviable callouses on their feet allowing them to walk across cinders that would cut the tender feet of the boys from the States. When Bill was released from Wakeman Convalescent Hospital at Camp Atterbury, he returned to the farm. He gave away his hunting rifle.